VH1's new talk show/cooking show/argument for the legalization of marijuana-hybrid Martha & Snoop’s Potluck Dinner Party premiered Monday night after what feels like a year of anticipation (despite the fact that it’s only been three months), and I’m happy to report that it was a delightfully silly—if a little creaky—hour of television. “I’m not high right now,” Snoop says as the show begins. “But whoever gave us this show, they must have been.” He might be on to something there, too. 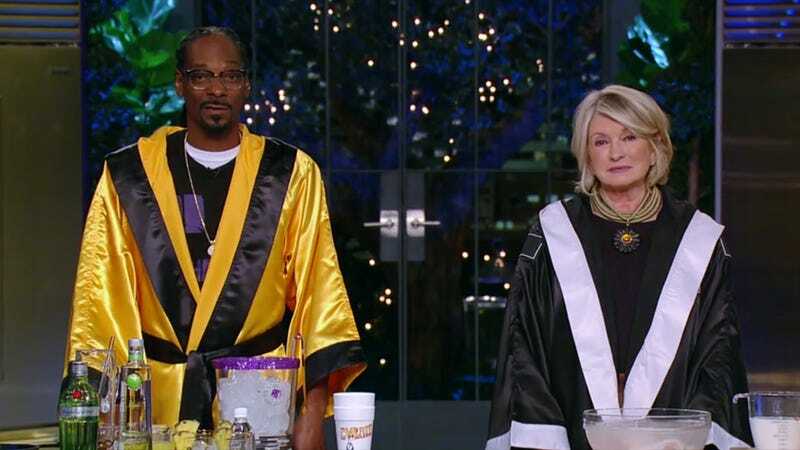 Martha & Snoop’s Potluck Dinner Party could be described as the televised equivalent of the munchies, that cliched, weed-fueled desire for sweet and salty snacks in shiny, colorful packaging, that—while free of anything resembling nutrients—are precisely what you were craving. This show is funny and charming where it counts the most, and unfocused where it counts a little less. If a more traditional talk show like Late Night is set up like the Oscars, MSPDP is set up like the Golden Globes. Guests are more intimately placed at large tables, not stadium seats. The hosts are a little wackier—think Amy Poehler and Tina Fey vs. Steve Martin and Alec Baldwin. And the cooking—much like the those particular awards themselves—doesn’t really matter. The structure of the show, which Snoop explains mixes “high society and high society,” goes something like this: Martha and Snoop introduce the theme (in this case, a fried chicken contest), make jokes about weed, bring out their guests (Snoop got Seth Rogen, Martha got Wiz Khalifa), cook their meals, make jokes about weed, eat their finished dishes around the table along with a surprise guest (it was Ice Cube this time), make jokes about weed, and then a musical artist plays them out. The “she’s white” and “he’s black” jokes get stale after a while, the actual cooking segment is surprisingly dull given the talent, and you can’t help but feel like everyone involved is still working out the kinks, but Snoop and Martha chummy rapport is so good that it easily excuses the show’s missteps. Even Rogen and Khalifa—whose initial woodenness makes them seem like part of a dare taken too far—succumb to the infectious charisma of the show’s hosts and prove themselves to be great guests. That charm is most evident during the show’s latter half, when the eating portion of the potluck (was it really even a potluck?) begins. In the first episode, they play a variation of two lies and a truth (“Two Thighs and a Truth”), during which Stewart reveals that she has been struck by lightning not once, not twice, but three times. “It does make you stronger,” she assures her friends. Martha just shakes her head. “I’m not religious,” she says dryly before taking another bite of her fried chicken. This entire segment is so funny that as I watched the five buds sit around and talk to each other about Martha and Snoop’s different methods of cooking chicken, I wished it could have lasted longer than the clunkier cooking half. But oh well. It’s only one episode, and my complaints are minimal. 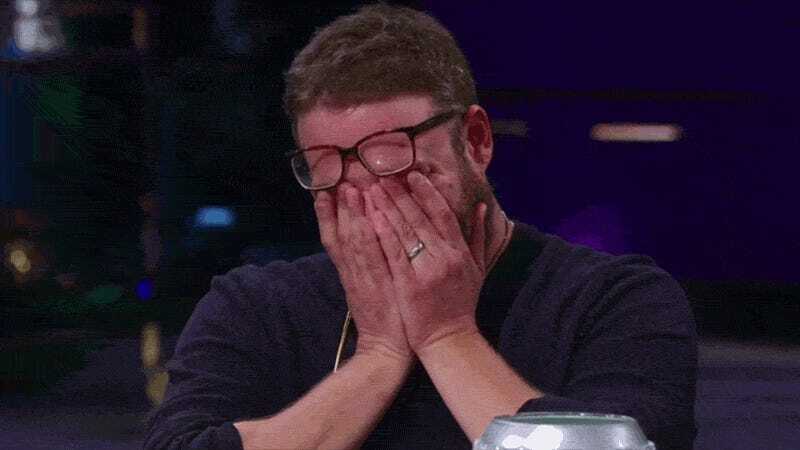 I still basically felt just like Seth Rogen throughout the entire premiere.